Bottled Water - Is It Worth The Price? There is no doubt that water is good for the body. In fact, about 70 percent of the body is made up of water. 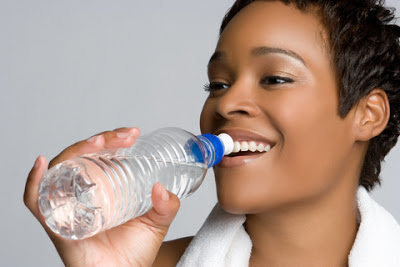 So, it makes sense that drinking eight glasses of water a day will help the body function properly. But bottled water has become a $7 billion dollar industry. How much can you rely on advertising that attempts to convince consumers that bottled water not only tastes better but IS better? Most people buy bottled water for the taste, purity, and convenience. Bottled water eliminates the taste of chemicals used to purify city water from bacteria so it is safe for city residents. Advertising touts bottled water as "spring water," "glacier water," "pure." But is it all safe and pure? Research has shown that about 25 percent of bottled water on the market is just tap water. These were the results found by the National Resources Defense Council (NRDC) based on a four-year study on more than 1,000 samples of 103 brands of bottled water. Coca-Cola has recently been under scrutiny for selling Dasani bottled water advertised as "pure, still water" coming from natural springs. It turned out that Dasani is nothing more than purified tap water. There is nothing wrong with purified tap water. It is better than water straight from the tap, but consumers do not like to be deceived. In addition, those 103 brands of bottled water that were tested by NRDC resulted in 18 containing bacteria. In addition, about 20 percent of the bottles contained industrial chemicals and chemicals used in manufacturing plastic bottles because the chemicals actually absorb into bottled water from its plastic container. An equally disturbing side affect of the bottled water industry is the impact on the environment. Out of the 50 billion bottles of water that are sold each year, 80% end up in a landfill rather than recycled. An alternative to consider is purchasing a water purifier and filling your own water bottles. Water filters can remove cryptosporidium from drinking water; cryptosporidium is actually a single-cell animal-like organism that lives wherever moisture exists. It can cause severe gastrointestinal illness. Even city water treatment and bottled water companies cannot remove this. Water filters give you more control over what you are drinking, they are more economical, and by using your own personal water bottle, there is no harm to the environment.